Character is problem faced by young generation. On globalization era, youngs generation have been crisis of morality or moral decadence. One of characters has increased for children is individual character. It cause kids less interaction, and adaptation in society. Therefore kids will be apathetic and anti social in their environtment. The current situation gadget influence in development on kids, so that kids have attitude anti social. They often play gadget after school. They just focus play gadget without communication and adaptation with their friends. They prefer to use gadget than they play together in environtment. As the result kids are sometimes for interaction with society. Moreover Interaction and adaptation in society for kids have faded, because kids play gadget lonely until ignoring immediate environtment. Anti social behaviour gives disadvantage for society, it is caused by anti social actors don’t like social order wanted by most of people in society. Then inderectly anti social behaviour describe social community, social problem and many others. Beside of that, it must be prevented as possible soon, in order that it doesn’t make criminals later. Then According Rahman (Yulia, 2009) said the problems of development contain emotional and social on kids when preschool put in an appearance like angry, afraid, jealous, to another people. If this situation let will influence negative effect for kids, whereas they are rising generation future. Therefore the most important social behaviour communicate in society. Furthermore, to eclipse this problem use traditional games. These games contain characters values. One of them is social character. So that we must awaken or play back traditional games for kids. By playing kids will be communication, interaction, adaptation each others. By interaction, kids can develop social behaviour in society specially for their friends. In this case, I want urge kids there in playing traditional games. Where they live in Guguak Malalo village. The best of part they play gadget, so they don’t know about traditional games. Therefore I summon up kids to play together like Congkak games and karet games. They are very enjoy to play these games. 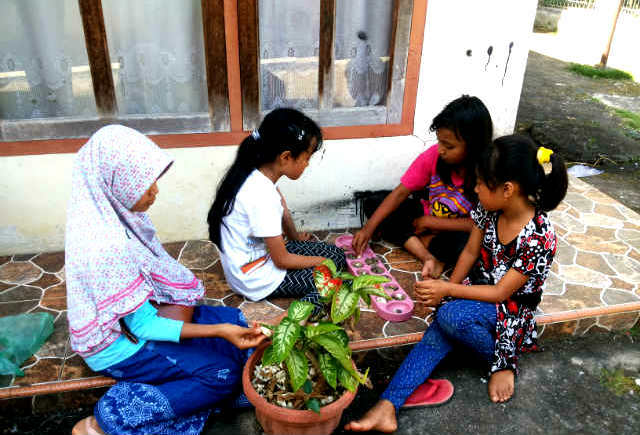 Then they are pleach communication, interaction, and adaptation each others during playing. They play after school around 2 pm until 3.30 pm. They use time off for playing traditional games. It can be concluded traditional games contain social behaviour, because they will be communication, interaction and adaptation each others.